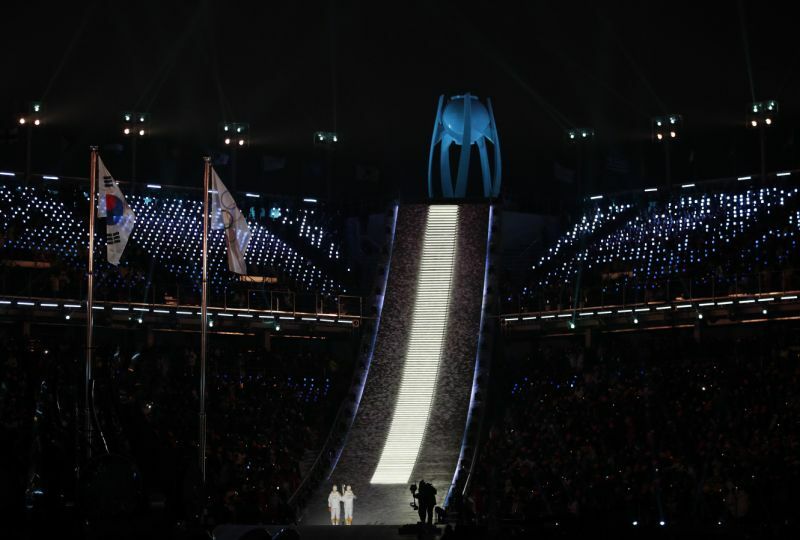 Friday’s Opening Ceremony for the Winter Olympics in Pyeongchang, South Korea was marked with politics and spectacle. 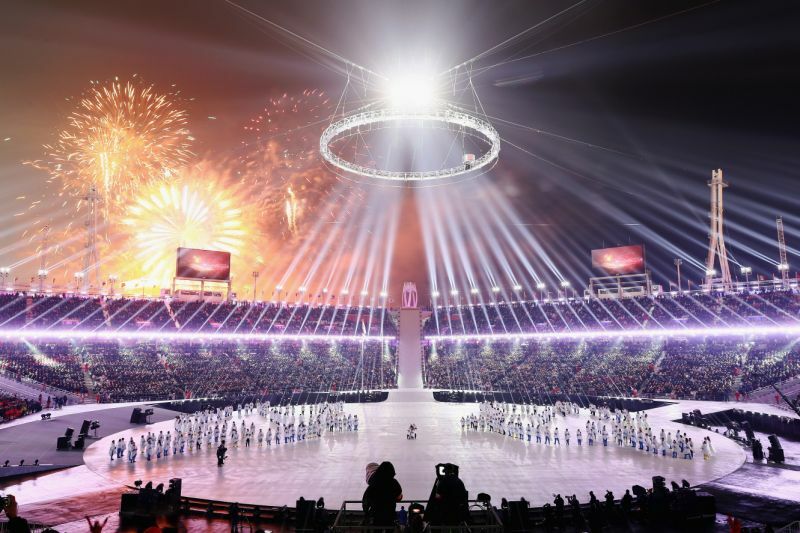 While the animosity between North and South Korea was put on hold as the two delegations marched as one under the skeptical eyes of U.S. Vice President Mike Pence, there was no tension on stage as stunning visuals made for a spectacular kickoff to the Winter Games. Drones lit up the sky in to create remarkable technical visuals that stood in contrast to the humanity of the march of the athletes that gave us the return of the shirtless Tongan and Bermudans wearing Bermuda shorts in frigid temperatures. But perhaps no moment was as dramatic as the actual torch lighting. North Korea’s Jong Su Hyon and South Korea’s Park Jong-ah, members of the unified Korean women’s hockey team, stood with the Olympic flame at the bottom of giant staircase looking up at the unlit cauldron atop Pyeongchang Olympic Stadium. The two Koreas marched together and South Korea's president shared a historic handshake with Kim Jong Un's sister as the Pyeongchang Winter Olympics opened in a spirit of intense rapprochement on Friday. At a glittering but sub-zero ceremony, South and North Korea brought the crowd to its feet as they entered behind the blue-and-white Korean unification flag. 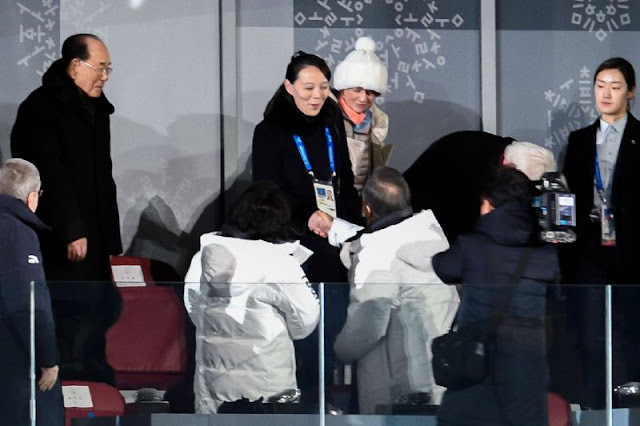 South Korean President Moon Jae-in shook the hand of a smiling Kim Yo Jong, the powerful sister of North Korean leader Kim Jong Un, as he entered the VIP seating section, and again as the Korean athletes marched. 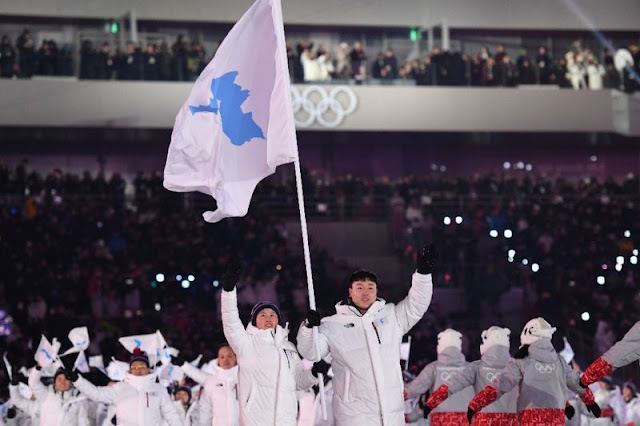 It cemented what has been a rapid improvement in Korean ties since North Korea -- after months of fierce nuclear rhetoric and missile tests -- agreed last month to attend its first Olympics in the South. Kim Yo Jong, the first member of the North's ruling dynasty to venture South since the Korean War, forms part of the highest level delegation ever to cross the border. South and North Korea last marched together at the 2006 Winter Olympics in Turin. 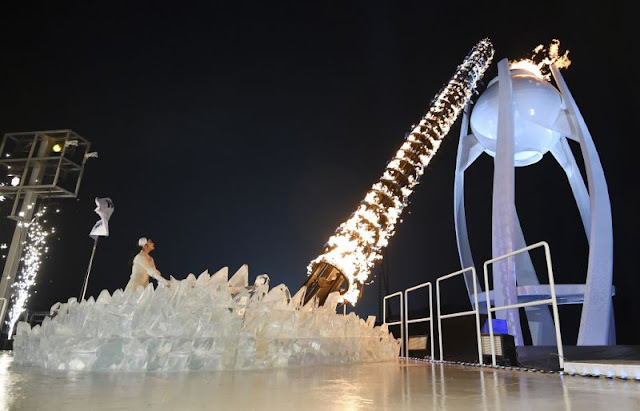 They also made the symbolic gesture at the opening of the 2000 and 2004 Olympics in Sydney and Athens. (cited from Yahoo reports). the powerful sister of North Korean leader Kim Jong Un. The 2018 Winter Games kicked off Friday in Pyeongchang, South Korea, with an opening spectacle for the ages, complete with dancing, drones, fireworks and even a little diplomacy. Transmitting an overriding message of peace and harmony, the dazzling variety of routines showcased Korean culture, and parts of it were set to a Korean pop music soundtrack. Technology took a front seat in the ceremony. with the creative use of elements like more than 1,200 drones lighting up the sky to depict athletes in action. The Olympic flame was lit toward the end of the opening ceremony, declaring the Winter Games officially open. A makeup artist applies glitter to a performer backstage. Olympic athletes from Russia's (OAR) parade during the opening ceremony. Banned from participating as representatives of Russia due to a doping scandal, they were required to wear neutral uniforms with no country designation. Flag bearer Erin Hamlin of the United States leads her team. Flag bearer Pita Taufatofua of Tonga and teammates enter the stadium. The Jamaican bobsled team made a grand entrance, dancing as they went. The North Korea and South Korea Olympic teams enter together under the Korean Unification Flag. A historic moment. Snowboarder Shaun White and freestyle skiier Gus Kenworthy of Team USA.